GROMACS is one of the most used packages for molecular simulations, chemlab can provide a modern and intuitive interface to generate input and analyze the output of GROMACS calculations. To illustrate the concepts we’ll perform a very simple simulation of liquid water. This depends on the system you’re using but I believe that GROMACS is already packaged for most linux distributions and also for other operating systems. The starting composition and configuration of our system. This is provided by a ”.gro” file that contains the atom and molecule types, and their position in space. Information about the connectivity and interactions between our particles. This is called topology file and it is provided by writing a ”.top” file. Simulation method. This will require us to give parameters on how we want to make the system evolve. This is provided by an ”.mdp” file. chemlab can help us to build any system that we want and we’ll use it to write a ”.gro” file. Then we will use chemlab to visualize and analyze the result of the GROMACS simulation. 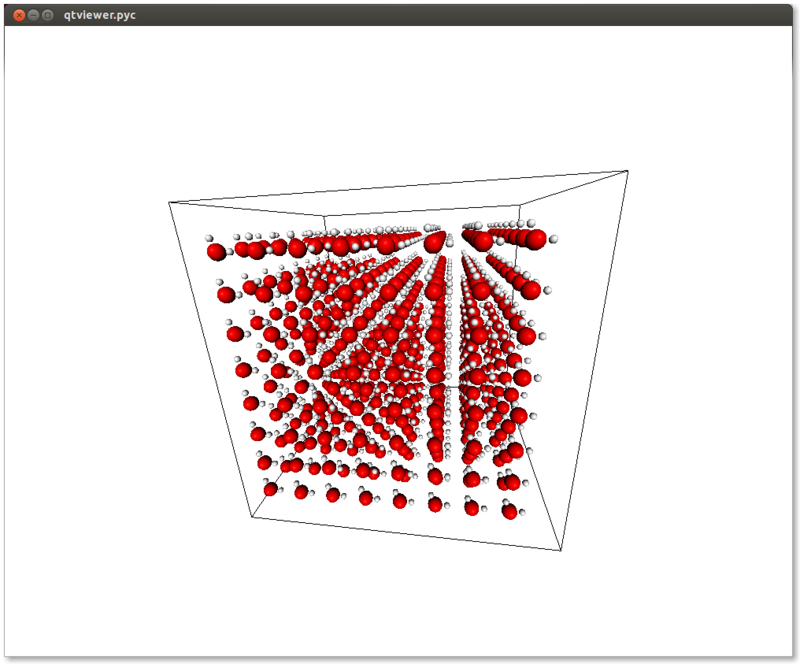 There are many ways to generate a box of water, in our example we will place 512 water molecules in a cubic grid. The advantages of doing that is the simplicity of the approach and the fact that we are naturally avoid any overlap between adiacent molecules. Add the molecule to a preinitialized System. Awesome! Now we can write the ”.gro” file. Notice that when we defined our water molecule we had to pass an export dictionary to the atoms and molecules. The export mechanism is the way used by chemlab to handle all the variety of different file formats. In this specific case, gromacs defines its own atom and molecule names in the ”.top” file and then matches those to the ”.gro” file to infer the bonds and interactions. This will generate a bunch of files in your working directory. This will take a while depending on your machine. If you are not a coffee drinker, don’t worry, you can stop the simulation by pressing Ctrl-C. The good news is that chemlab can read files from partial runs! To quickly preview trajectories and system energies you can use the script chemlab included in the distribution in scripts/chemlab . The chemlab gromacs command is a work in progress, the syntax may change in the future. It is also possible to view and get the results by directly reading the files and have direct access to the xtc coordinates and the energy stored in the edr files. Take a look at the reference for chemlab.io.handlers.XtcIO and chemlab.io.handlers.EdrIO.